Booger has the softest, baby-fine fur on the top of her head. But when you feel down her body, her fur is thick and coarse. Is there any way to change this? I've met pugs that have fur all over that's as soft as the top of her head, and I'm trying to figure something else out in her diet or grooming habits to make her baby soft, too. My two pugs have differently textured hair. The black pug's fur is silky and the fawn's is course. I suppose it is just in their genes and can't be changed. Also, my black pug doesn't shed nearly as much as the fawn. I have two pugs, one fawn and one black, and their hair is exactly as described by Barbara. The black pug has very fine, silky fur, while the fawn has more coarse, double-coat fur. I rescued Frankie from the desert. His hair was very coarse. I feed my pugs a homemade meal of: ground turkey, mixed veggies, brown rice. I add omega three oils or salmon oil. I get Biologic Fats - His coat is soft and silky now :-). I bath him in blueberry or oatmeal shampoo. My old guy gets sweaty under his arms but he also starts to get little hot spots under there that can smell. I try to keep the area clean and dry (wiping with a baby wipe between baths). BioFATS is a comprehensive essential fatty acid source for cats and dogs with an added potent antioxidant base. This formula offers a healthy supply of active Omega-3 and essential Omega-6 fats which are not supplied at requisite levels in dry, processed foods. The body cannot manufacture these essential fats; they must be supplied abundantly by the diet, providing the body with substrates for hormones and cell membrane structure. This formula includes flaxseed, hempseed, and wild salmon and krill oils, along with antioxidant ingredients like Vitamin C and E, for a comprehensive source of Omega-3 and Omega-6 fatty acids. BiologicVETnx formulations are based on nutragenomic science and guided by nature's wholeness. They stem from the research of company founder Franco Cavaleri, a nutritional biochemist who has developed many human supplements as well. BiologicVETnx products contain no wheat, corn, soy allergens, added sugar, sodium, artifical colors, flavors, or preservatives. Great ideas for the future! My pug is still just a tiny baby, but I'm sure this info will help a lot in the futre. Also, from what I've read, the reason why Black pug's coats are softer, is because they only have a single coat - where as the fawn pugs have a double coat - and the hairs are thicker - i.e. coarser. It's natural, and you can only make it "so" soft because you're fighting against nature. Repeat after me, "I loveFrito-feet!!" I never put it together that it was the smell of their sweat but that must be it exactly! Dogs do actually "sweat" a bit through their feet, but predominantly get rid of their heat by panting. Since our puggers aren't as effective panters like other breeds, I imagine that they sweat a bit more to keep cool. We always tease Joy, our nuclear-hot little girl that she has sweaty pits. With regard to the fur softness, I think it varies from pug to pug, just like our own hair varies from person to person. Diet and a good conditioner are helpful, but ulitmately I think it's just what makes your pug unique (Orion's fur has a bit of a wave at the nape of his neck). We have mom, dad and 5 of their kids and you can really tell who pulled more from whom and all the differences in between. If you want to try a good diet supplement, Solid Gold powder is quite good. Hugs to Booger!! Funny this just caught my eye even though it goes back to 2007. I have had several pugs, and they have all felt different as far as hair texture is concerned. 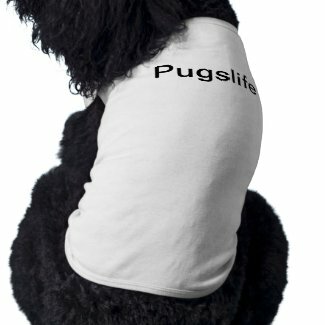 Right now I have a black pug who has very fine soft hair, and her hair shines in the sunlight. My boy is fawn, and his hair is soft, but nothing like Lizzy's. When I get him shaved, which I do about twice a year, he is then real soft until his hair grows back in. I think you will find your pug is a double coat, and that is why his hair is bot as soft as you would like. The hair on their head is not like the hair on their body since the hair on the head is real fine. As for the smell, well just think they do not have hair under their arms, and their skin could sweat under there. I have just replied to this when I noticed how long ago this was posted, do not think it will matter, I think I probably di not have the problem with Hektor when it went up he had only arrived. Sounds like she has a yeast problem Madeline. Get her off Dry food, mine is on cooked chicken and either brocolli or cauliflower. No amount of washing will cure that.If you check Yeast in Dogs on the internet you will find advice. It took me years and a long struggle to get Hektor anywhere near right, I had him on a raw diet with additions but last year I took him off everything and put him on the cooked chicken, smell has almost gone he no longer itches half as badly. It took two years for this problem to manifest itself, I cannot remember how old Booger is? If it is yeast and smelling like Bread or a cookie is a good indicator then the only thing is to change the diet. As for the coat, they all differ, my three previous Pugs, one a family member, half brother to my two and belonged to my Mother in Law, well I could tell them all apart in the dark but the feel of their coats. Henry my eldest had the thick rougher coat to Angus my young one whose coat was like silk. Hektor has a thick coat somewhere in the middle of the other two and Freddy my Mother in Laws was somewhere to the right of Angus, just not as silky. I still wash Hektor on a regular basis, I use something called Dermaease which my supplier has on eBay, from Shampooch Shop. Hope that helps.